Secret Wars #8 is here!!! It has arrived!!! The conclusion to Jonathan Hickman and Esad Ribic’s epic, universe-shattering event has finally come!!! 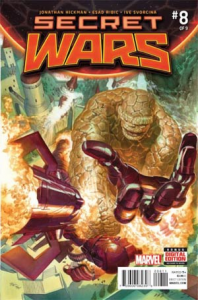 I kid, of course—Secret Wars was extended to 9 issues, with the actual finale now pushed even further into January. Nevertheless, Hickman and Company bring the action for Secret Wars #8 in ways that are shocking, brutal, and only fitting for a climax to an event with “Wars” in the title. I’ve been covering Secret Wars for Talking Comics since the very beginning last Spring, and I was and still am a big fan of the Game Of Thrones-esque, elevated high fantasy of Hickman and Ribic’s world-building, world-spanning saga. If you look back at those early reviews, you’ll notice that one of the strongest elements of Secret Wars was it’s totally off-the-wall, completely out-there interpretation and application of our favorite Marvel characters and tropes. From God Doom to Sheriff Strange to the Thors to the Wall Shield, Secret Wars was at it’s best when Hickman was doing whatever he wanted. The same held true for the spin-offs and “tie-ins”; the wilder, the wackier, the more innovative mini-series were often times the best. Of course, I did miss covering a couple of issues, and those were Secret Wars #6 & #7. Here’s the short version: they were confusing, but well-crafted. Characters were strewn about Battleworld, interacting with characters for no apparent reason, in certain places with little to no context or explanation. Pieces had been moved between issues #5 and #6 that proved too dramatic and drastic to carry attention. Combine that with the constant delays and I was like “what happened?” With no actual “tie-in” series explaining the situations of some of these characters, there was no context. In some ways, that confusion has undercut the impact of the climax seen in Secret Wars #8, as betrayals and deaths and big reveals lack the necessary clarity in set-up to really hit. Regardless, I will say that Secret Wars #8 features betrayal and death and reveal after betrayal and death and reveal. With not just a sandbox, but all the entirety of sand to play with, Hickman can literally do whatever he wants. And he literally does whatever he wants here, as some of the most prominent characters in the book so far are brutally, shockingly, and, in some instances, hilariously taken off the map. If you wanted a War book, it has arrived. Ribic and Svorcina continue to deliver high-fantasy artwork to perfection. There are some questions of choreography in this issue, as some panel shifts are disorienting or don’t clearly demonstrate where we are in space, making for some lapses in the action. And there are also some GIGANTIC EXPLOSIONS that seem to be fairly definitive in terms of death and destruction, but the aftermath is sometimes underplayed or unseen. Nevertheless, the consistency and power of Ribic and Svorcina’s work has made Secret Wars a compelling event from the beginning, and I’m excited to see the whole team finish it off next issue. I mean, if you’ve made it this far! At this point, things are just going absolutely apes%!$ over in Battleworld…Characters biting it left and right—Doom all like “what is happening!? ARGHH.” I mean, there’s a Galactus fight in this book. Come on! I know the book never comes out and I know that Marvel has moved on and Secret Wars might feel a bit moot at this point, but Hickman and Company are still dedicated to giving us an epic, compelling comic book saga, and, man, do they deliver. One issue left to go in Jonathan Hickman’s epic Secret Wars! What will happen to the Marvel Universe? Will our favorite characters triumph in the end? When will Secret Wars #9 actually hit the stands? WHO KNOWS, True Believers!!! Who knows! ?